Today The Zamir Group, #1 Selling Group in the NJMLS for 2016, is proud to announce an exciting new listing in Cresskill, NJ. 111 5th Street is a recently renovated home with all the trappings of a great Bergen County residence. It boasts gorgeous details and elegant style, plenty of space to live and spread out, a large fenced yard and prime location. We are very excited to share this home with you today, and to host an open house there Sunday. The weather may be cold but the market is still hot. If you are interested you shouldn’t delay. Call Today to schedule a showing – This one won’t last! Prime Location near Transportation, Access to Top Rated Schools and More! Covered Entry – great for breezy summer days as well as winter sleet and snow! Open Feel, Attaches to both the Dining room and the Great Room, with additional sliders down to the patio. The heart of the Home! Large Yard. Full Privacy fencing, patio, deck and plenty of space to play and entertain. Like the area but need more house? Be sure to check out our nearby listing at 76 Westervelt Pl! Work With The Zamir Group Today! When You Hire Us, You Are Hiring More Than Just a Real Estate Agent. We Are a Team of Sales Associates, Buyer Specialists, Broker Associates and Realtors ® Backed by a Dedicated Operations and Marketing Team. 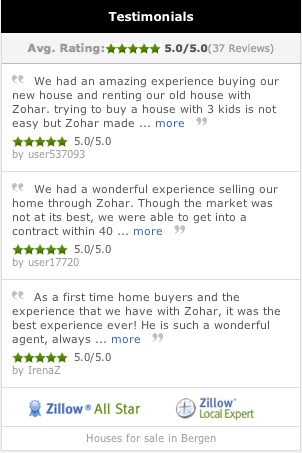 Led By Zohar Zamir, a Top-Producing Broker Associate/Realtor ®, 5-Star Professional for 5 years (2013-2017) running, 2013-2015 NJAR® Circle of Excellence Sales Award®, PLATINUM Level #1 in Sales for the Entire NJMLS in 2016 – The Zamir Group is Bergen County’s Premier Real Estate Team.